← A Liberty Christmas Cambie! I seem to buy far more fabric than I have time to sew. The trunk containing my stash is now refusing to shut and when I toted up all the things I have on my ‘to sew’ list, which I already have the fabric and patterns for, it came out at a round twenty (this accounts for only a third of the fabric I have stashed away!) Some have been on the list for well over a year but every month get bumped downwards after a successful haul at the fabric shop. So when Sally from A Quirky Peach announced a Summer Stashbust it seemed like the ideal opportunity to get some of those poor bumped projects brought to life. 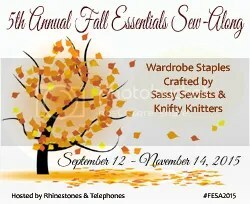 From 21st June until 21st September I will not be buying ANY NEW FABRIC, sewing exclusively from my stash. I don’t know how I’ll cope going cold turkey like this, my monthly payday fabric shop is something I look forward to (so much so I have trouble sleeping the night before, wondering what delights await me in the morning) But now my other half has found my secret stash of knits at the back of the bathroom cupboard (he doesn’t know about the one in the loft) and I must admit that I have more than a touch of fabric compulsive disorder. 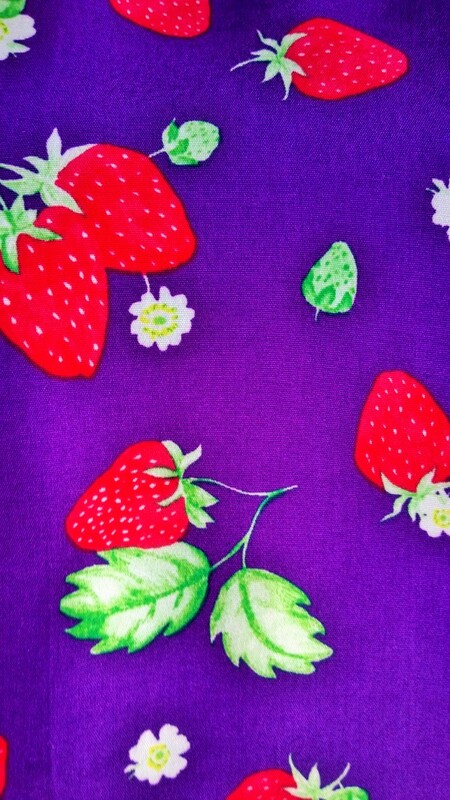 My rational was that purple is my favourite colour and strawberries my favourite fruit, put together this was the perfect fabric! (I bought mine in Economy fabrics but you can get it on ebay here!) It was only when I got home and proudly showed my other half the latest haul that his raised eyebrow cast a shadow of doubt in my mind. In the trunk it went while I pondered what to do with it. 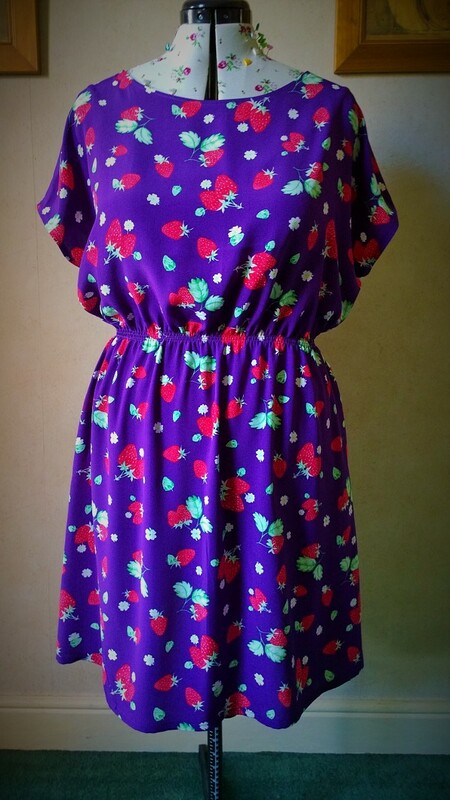 Inspiration came in the form of Wimbledon, the perfect excuse to wear a dress with Strawberries on! I knew I had to keep it simple as the fabric was so busy, anything fussy would be too much. I had just bought the perfect pattern parcel #3, primarily for the Bombshell Swimsuit pattern but it also included the April Rhodes Staple Dress. 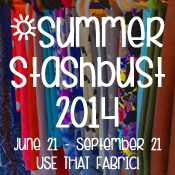 There had been quite a few versions popping up on the blogesphere and it looked like the ideal canvas for my fabric. It’s a very simple pattern, only two main pattern pieces, kimono sleeves, in seam pockets with elastic shirring at the waist, which gives it it’s shape. I cut a size large and took 2 inches off the length of the bodice. I then had a quick panic and added an inch back on to the length, figuring I could always take it off again later. The dress came together like a dream. The sleeves and neckline are finished with what is called a facing but is basically a strip cut on the bias. I didn’t follow the instructions, just folded it double, stitched it around the outside, raw edges together, then folded to the inside and topstitched it in place. I was a little worried that it looked a bit tent like once I’d put it together but when I put a belt on to work out where my waistline fell I could see the potential. The next bit was the fun part: shirring! 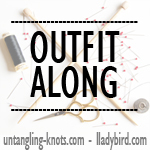 I absolutely love shirring! I made a maxi sundress last year following By Hand London’s Shirred Top Tutorial and it was so much fun! (although I did have to do 30 rows of it to safely ensure the girls were well covered!) I decided to do four rows on the waistline but very close together so that it had strength but didn’t look too ‘elasticated waisty’. 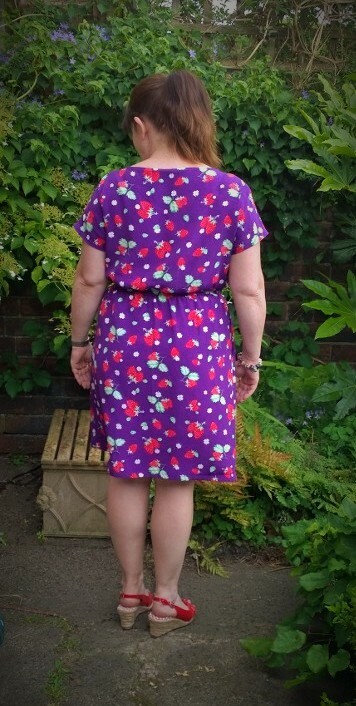 However, it was the first time I had done any shirring in the middle of a garment, I was getting so carried away that I managed to catch the skirt THREE TIMES! After spending time carefully unpicking my enthusiasm I eventually got the four, relatively straight rows, at a total depth of about a centimetre. Once I tried the dress on I was glad I’d added the extra inch in length as it was knee baringly short! 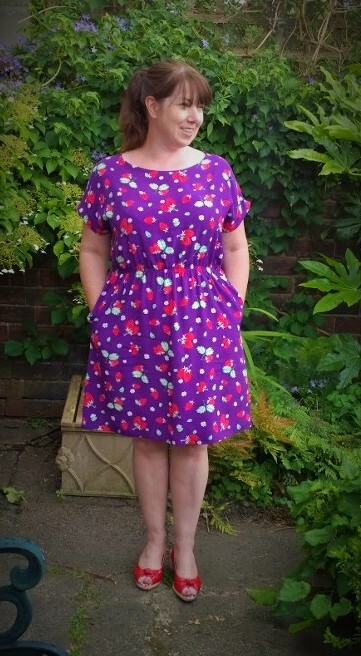 I hemmed it with a tiny centimetre double fold hem and, although a little shorter than I usually wear (I try to hide my knobbly knees!) it turned out OK.
I’m actually really pleased with the result, I was a little concerned that it might be wearing me, but I think I’ve just managed to get away with it! I did try it with a variety of belts but it just didn’t look right so I decided to wear it without. It’s the perfect everyday dress for running around in and the fit is very forgiving of big lunches! It’s also the perfect beach cover up and would look great in a Voile or Chiffon over a swimsuit. 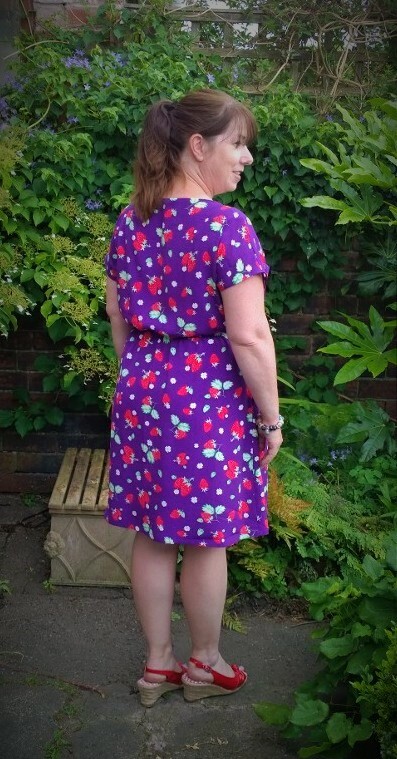 It was a very quick and easy dress to make, taking about three hours including taping the pattern together, simple sewing with instant gratification, just what I needed! Is your stash getting out of control? 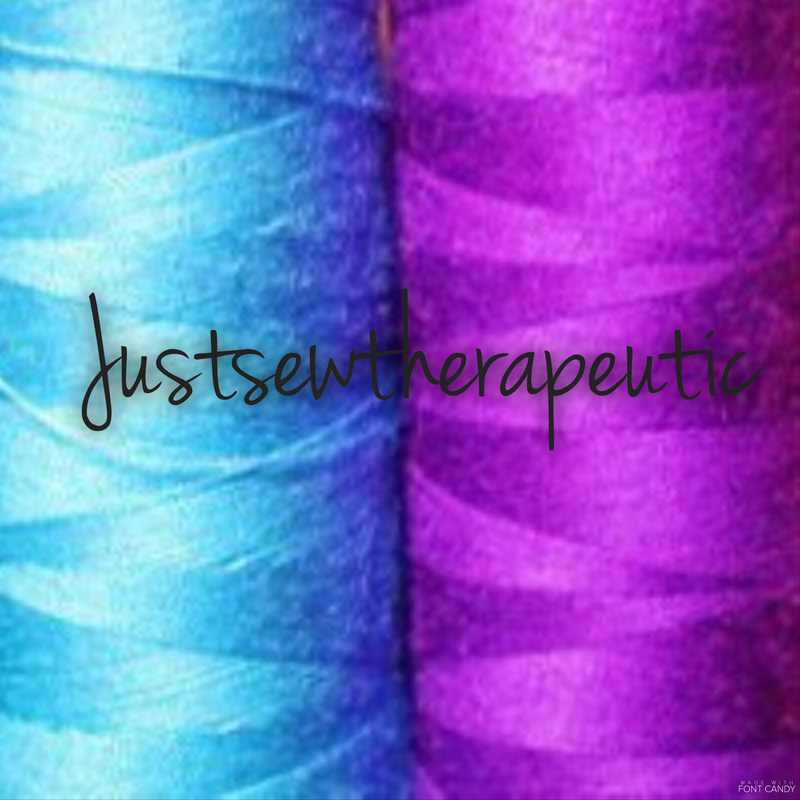 Could you last three months without buying new fabric?! 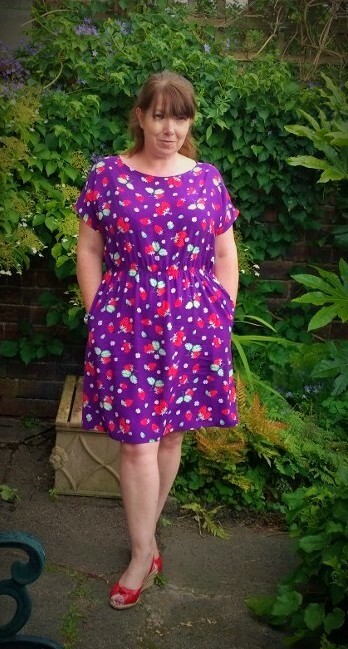 This entry was posted in Finished Sewing Projects and tagged april rhodes, quirky peach, shirring, staple dress, strawberries, summer stashbust. Bookmark the permalink. I need to go on a stash-diet too. My stash isn’t particularly big but I have very little storage space for it, so I have to keep it under control. Also, I don’t have money to throw away, and having fabric sat in the stash really ties my sewing money up until it turns into something I can wear. And if those weren’t good enough reasons: I *want* some nice new things for summer! I’m trying to prioritize summer clothes, there’s a few I need before I go on holiday in August, mainly the Bombshell Swimsuit. I know what you mean about wanting new clothes, I just find it difficult to decide which I want most! If only there were a few more hours in the day! It’s not just me then! I love going through my stash, finding things I forgot I had, trying to figure out what to make by draping them over my shoulder, it’s like looking through a treasure chest! I really don’t know if I can cope for three months without any new addition’s! That looks Perfect on you! So fun…! Have found you from MMM and thoroughly enjoyed seeing all your lovely garments. This dress is perfect for Wimbeldon and you will have so much fun with it, love how you have made the style work. My stash is getting out of control and so far this year it has increased by 45 metres this year already! I love your Staple dress– that fabric is super fun. Love the fabric! I recently bought a crazy-busy fabric to make a Staple dress. I’m a novice sew-er, and am afraid to shirr the waist, so I am thinking about sewing a sash belt in a contrasting fabric to tie around my waist.